The China A-Share market provides access to compelling long-term investment themes in China, in particular the emerging consumer and technological innovation. Uncorrelated, under-researched, and inefficient, the China A-Share market provides significant diversification potential to global investors. A portfolio of quality growth companies across the market-cap spectrum provides access to one of the largest, most liquid, and fast-growing markets in the world. Combines deep fundamental research with systematic inputs to consistently identify alpha opportunities. William Blair has over 20 years of experience investing in emerging markets with the same philosophy and process. We have been investing in China since 1996 and in China-A Shares since 2013. We manage $12.0 billion in emerging market securities across all strategies, $9.1 billion in dedicated emerging market strategies, and $3.6 billion in Chinese equities across all strategies as of December 31, 2018. 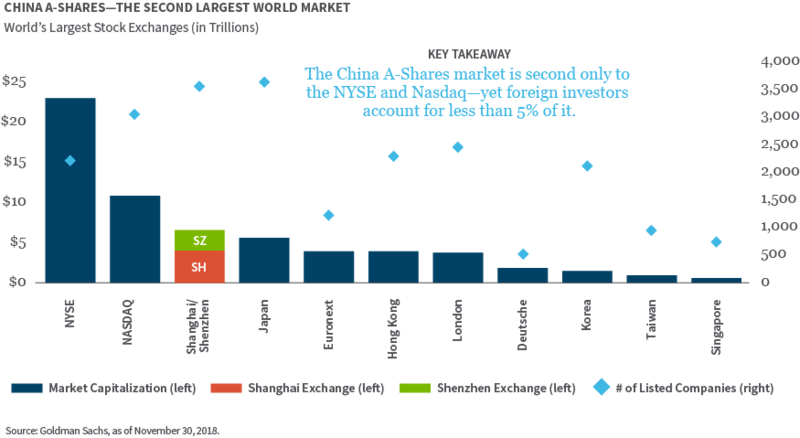 China A-Shares are clearly where investors want to be to gain access to Chinese growth opportunities. Growing foreign investment combined with an uncorrelated, inefficient market should create opportunities for active managers. When MSCI adds China A-Shares to its indices beginning in June 2018, the market’s relevance to global investors should increase.